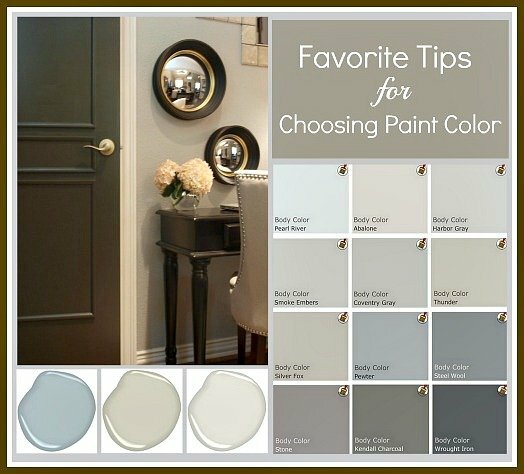 Last year, I shared my favorite tips and tricks for how I choose paint colors. I have a different approach when it comes to choosing paint colors and some of you may have seen that post. It’s my most popular post since I have been blogging and every month, I am always so surprised to see it pop up as my most visited blog post for the month. 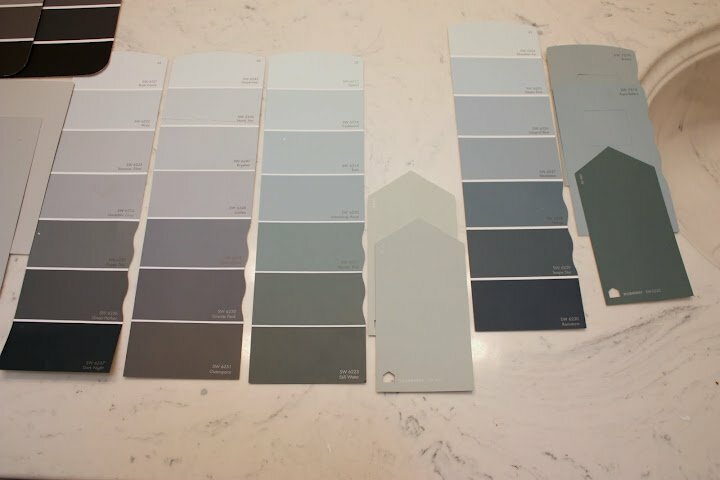 It just goes to show how so many of us really struggle with how to narrow down and choose paint colors for our home and I really hope that my post has helped in some way. So today, I have updated that post with new paint color inspiration and I am also reposting the tutorial for how to eliminate undertones and shades and zone in on just the right colors. This is a long post because I went into great details but if you stick with me through the end all six steps, I promise, you will see that this is a really fast process and automatic. If you approach paint colors through a process of elimination, the perfect color for a room will jump out at you and make this process so much easier and a lot less painful. These little tricks give you a quick way to make a color decision that you will be happy with and no more guesswork. The main thing that has really helped me more than anything in choosing paint colors is that instead of focusing on the various shades of a color that I like, I change my focus and eliminate what I don’t like about a color. This makes the process so much easier and I automatically eliminate different elements (I will go into below) that make my final color choices obvious. When I am finished with my elimination process, I usually have one or two paint chip/cards left of my ideal color, making the paint decision obvious, instead of guessing if a color is right. This process also helps me to keep an open mind and broaden my color/shade choices and often times, my end color/shade is something I would have never considered in the beginning! Step 2) Determine (roughly) what color and tone you’re interested in for your space. 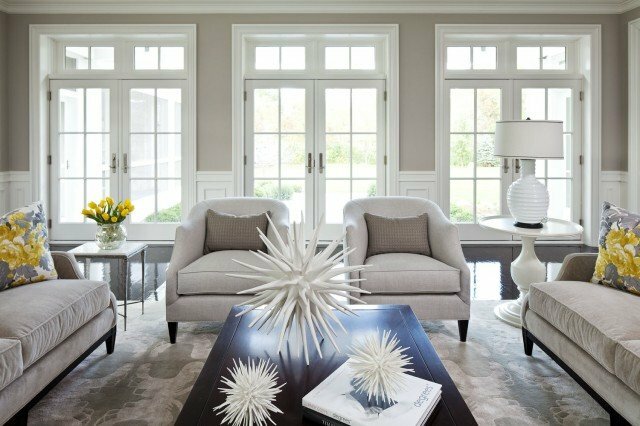 It’s really important to consider a smooth color transition from room to room and it makes all the difference overall in a home. This is big head start in narrowing paint choices by choosing the same undertone of a color of the space adjacent to the space you want to paint. For instance if one room is beige with a subtle green undertone and you want to paint the room next to it a blue-gray, choose a blue-gray with a slight hint of green undertone. Dunn Edwards Dunn Edwards DEC789 Light Gray, Flat. If your color in the adjacent room does not have a strong undertone that jumps right out at you, try bringing a lamp close to the wall or looking at the wall in both morning and dusk natural light. If nothing jumps out at you, consider the undertone a “neutral”. All colors have an undertone but some have more of a subtle undertone and this is where it gets dangerous! What seems like a safe neutral undertone can change and pop out under certain changes in lighting. All of the sudden you have what you thought was a perfect neutral beige and paint it on the wall, turn on the lights and now you have an ugly peach wall. Been there! 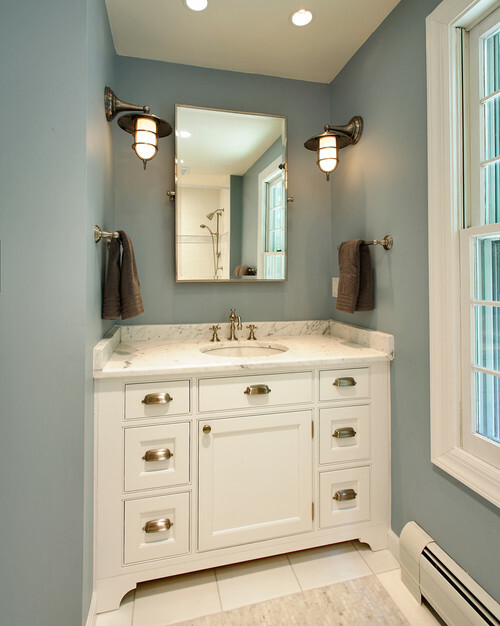 Traditional Bathroom design by Other Metros Interior Designer KannCept Design, Inc. If you’re having trouble deciding on what general color you want to paint a space- I’m talking you don’t even know if you want red, green, blue, ect., and need some inspiration, there are some amazing resources and inspiration out there for you. Pinterest has become an awesome resource to see specific paint colors already on a wall and in a space. You can search by a specific wall color (if you have the paint name) or many pinners like myself have paint color boards dedicated to paint colors and specific paint names. Once you have some idea of what color you want (and hopefully you have an idea of the undertone), head to your paint store and zone in roughly on your ideal color and tone and pick up the card/s. But wait!! Now pick up all of the tones and shades surrounding your “ideal” color, getting the paint cards at least three deep/beyond your original color and moving into the next colors. I pick up almost every shade and tone of my color because even if you think the color will never work, you have to have the surrounding cards to help you later quickly spot the undertone of the color. If you look above, you can see that I have the neutral tones of the blue-gray in the second column from the left. You can see that to the left, the cards move into the gray brown undertones and to the right, it moves into the greens and darker blues. So as you look at your laid out colors under the lighting for the room, eliminate and take away the cards of a certain undertone that you know you don’t want. If you know you want a certain undertone, you keep those cards. If you’re unsure, keep them for now. If you want to stay as safe as possible with a neutral undertone, go right to the middle and eliminate the cards to the right and left. When you lay your cards out this way, the safest and most subtile undertones can now be spoted immediately because they should be in the middle. Now that you’ve narrowed your colors down and eliminated tones, the next step is to eliminate shades. This another easy elimination. Obviously if you want a lighter shade of your color, eliminate the darker colors and vice versa. For me, I wanted something right smack in the middle. so I eliminated and removed the cards for the lighter shades and the darker shades and kept the shades in the middle. I know there are a lot of different opinions on choosing a shade of a color but someone once told me that for lighter shades, go one shade darker and for darker shades, go one shade lighter. I’ve always done that and it’s usually right on target for me. In this case, I wanted a medium shade and again, it’s obvious because it’s the color in the middle of my laid out cards! Once you eliminated the shades from your choices, remove the cards. For my guest bath, I picked the Krypton (the color in the middle) because the color to the right had WAY too much blue and the color to the left, didn’t have enough blue. Without laying out the paint cards and having the colors with the undertones to the right and left of my color, I would not have been able to see the undertone differences! Imagine how disappointed I would have been had I simply picked the too blue color to the right (Rain) at the paint store without seeing how much blue undertone it had! The moral of this super long story is that the only way you can truly see undertones clearly is by putting them next to similar colors with varying undertones and choosing colors with the lighting in the space. So the final choice is really the only big decision to make as the rest of the decisions are pretty much automatic elimination. 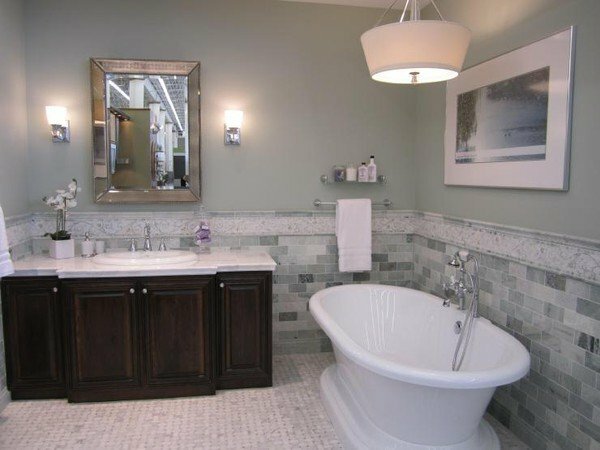 As you can see, even the final choice was hardly a choice to make in the case of my guest bath. Odds are that you have either nailed your final color/tone through this process or you’re extremely close but you may need to tweak the shade. Just to be safe, it’s best to get a small sample of your color and paint a large poster board in your sample color and let it dry. After it dries, tape it to your wall. You will quickly see if you want to go up or down a shade once you get it on the wall. Keep in mind that if you are torn to two final color choices, talk with the people at the paint store and they can suggest formula tweaks or diluting with a certain percentage of white. If you take away two things from me today, remember that you need to have colors surrounding colors to really spot true undertones and always choose your paint colors in the space you want to paint with the dominant lighting. If you just do these two things, I promise you, you will stand a much better chance of being happy with your final color choice! Brilliant post! Thank you so much for taking the time to be so specific. This is going to be so helpful! Thank you Kelly! I sure hope it helps! It has helped me so much and has made me feel more confident in my choices. Thanks for stopping by! Choosing paint colors has always been so difficult that I give up and go with white (Navaho White to be specific). I’m trying to get more color on the walls now but all my trim and doors are stained wood rather than painted. Any suggestions? Awesome post Cyndy! You’re making me want to repaint some rooms in my house after seeing these photos! Beautiful! Pinning for future reference – great tips! Great post! My husband and I are in the planning stages of our home building project and paint color is an area that I’m still wrapping my mind aroun. Your Paint It Monday posts have been very helpful. After living in apartments for many years I vowed two things when we bought our house, no more flat interior doors and no more white walls. Your post is filled with such helpful information in picking interior colors. Wish I had this post when I was deciding which colors to select. Well, I think it’s about time for color revamp, now which room wants to be first! Thanks Cyndy for sharing. Love this post! I’ve always felt so overwhelmed with choosing paint colors. Love your step-by-step, easy “elimination” approach…because it is so much easier for me to tell ya what I don’t like! LOL! The color palettes really inspire me too! My favorite paints in this post are BM Rockport Gray, Vapor Trails, and Abalone..and SW Sleepy Blue (ahh!) and Gibralter! Thank you for posting such great info and tips! Currently, my walls are sherwin Williams blonde and all of my trim is white. Any tips or suggestions in colors for interior trim colors that would pair well with the blonde? Do you have any suggestions on wall colors that go best with oak kitchen cabinets? My father was given an almost full, 5 gallon bucket of house paint. He wants to change the color to green and paint the shed. Where can I get a dye to change the paint color? Sherwin Williams Pilladium Blue?? I love the color in your pic but can’t seem to find it under that name…….help! Palladium blue is actually a Benjamin Moore color. I went to Sherwin Williams yesterday to get it and they said that they don’t have it and if they ever did it must be old because the girl helping me did not find it in the system. I am also looking for a nice blue to paint my master bedroom. I am now debating between BM Grossamer Blue and BM Yarmouth Blue. I felt the Palladium blue was more on the green side. take a look at BM Ocean city blue…Its really beautiful.. I love the colors in the opening photo of the greys…. just wondering what brand they are so I can starting painting my house!!! Thanks for hitting the nail on the head! I am in a bit of a panic. I need to pick a gray for living room, dining room, kitchen and den, they all share common walls. I am selling my house soon, and just had dark distressed wood floors installed. All my woodwork, trim, cabinets etc, are white. I need to pick a light gray that will appeal to the masses. I have not seen the 2014 grays announced or posted anywhere, but I have been following you a long time and I am sure you will know. I love just slightly blue grays, but can’t do that on these walls. I hate green grays, and really not overly fond of brown grays, but if it is very, very subtle I could live with it. I really want a true gray, but light, because even though my house gets a lot of natural light, I need to appeal to buyers, and darker grays are probably too dramatic. Can you make some suggestions? It most likely is Home Depot that will be supplying the paint, and I will run gt samples as soon as I hear from you. I hope I haven’t bothered you at a super busy time, I truly appreciate any guidance you can give me. omg! 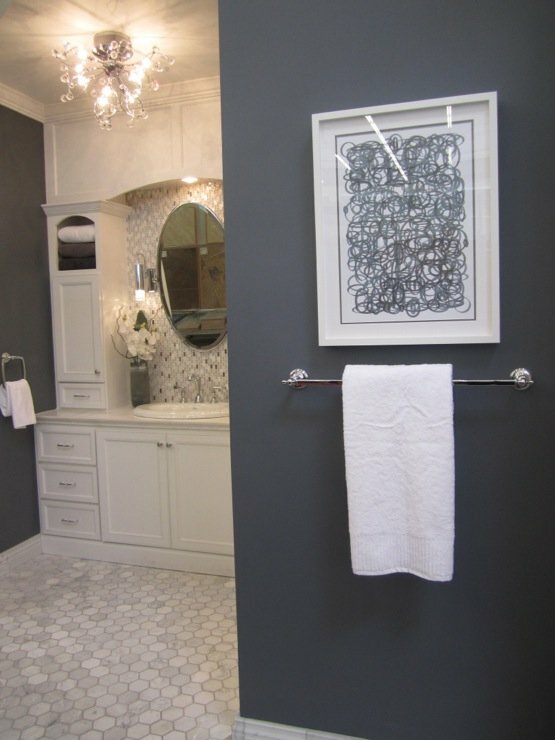 You would love elephant skin by behr paint. To me it is like the perfect gray. We used the ultra behr paint. If you go on pinterest you will be able to see pics of the different colors. Another color I looked at was fashion gray but I am glad we went with the Elephant skin because its bold but not too dark. I need to paint my foyer, which is open to the second floor, and the second floor halls. My kitchen, which has the stairwell to the 2nd floor has been painted in Plymouth Rock (BM) gray, which I really like. The living room (between the foyer and kitchen) is Meditative Blue. 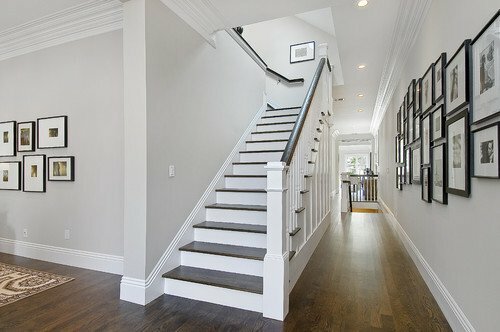 I’m thinking of doing the foyer/halls in Plymouth Rock but what is your opinion on adding a second, darker shade of the gray on the first floor of the foyer? There are walls that logically could be different. Is that “accent wall color’ treatment out of style? I just bought a new home down in Florida, I’m looking to do beach colors, love light shades of blues and greens but I’m not sure what colors to start with. Any ideas? Great post but what are the differences between tone, undertone, and shade? Thanks Teri! Undertone and tone are the same thing..This would be a subtle secondary color under the primary color. All colors have undertones and some are very prominent. For instance, you can have blue but it might be a blue green. Green would be the undertone (blue would be the primary). The shade is dark to light of the exact same color. Paint cards have one color on them but there are 7 shades (light to dark).. Hope that helps. My favorite is the Traditional Entry by Greenville… but it does not say the color or brand of paint. Can you tell us? I would love this same info, please! 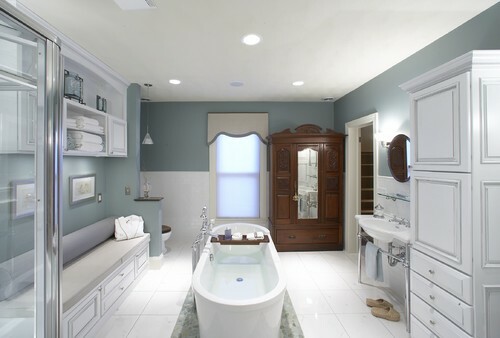 I found this photo of Linda McDougald’s entry online, as I was wanting to know the color, as well! I believe it is Berkshire Beige by Benjamin Moore. Loved this post on choosing colors! So helpful! Thank you for the great and detailed information. Something that I have done and works great when a color just doesn’t look right in a room is change the light bulb. Try switching from a Soft White to a Reveal light bulb or visa versa. I’ve seen the Reveal light bulb with a blue tint and a pink tint. Hope this helps someone. What color would you recommend to pair with Providence Olive? I love all these light grays, sea foam blues, and light whites. But, I have cherry woodwork throughout my Cape Cod house. Do you think they would be too light? I have large windows and lots of light. BM Ocean City Blue…I painted my diningroom this color 4 years ago and may I say I’m still in Love with it….. I like the S-W Gilbralter best. 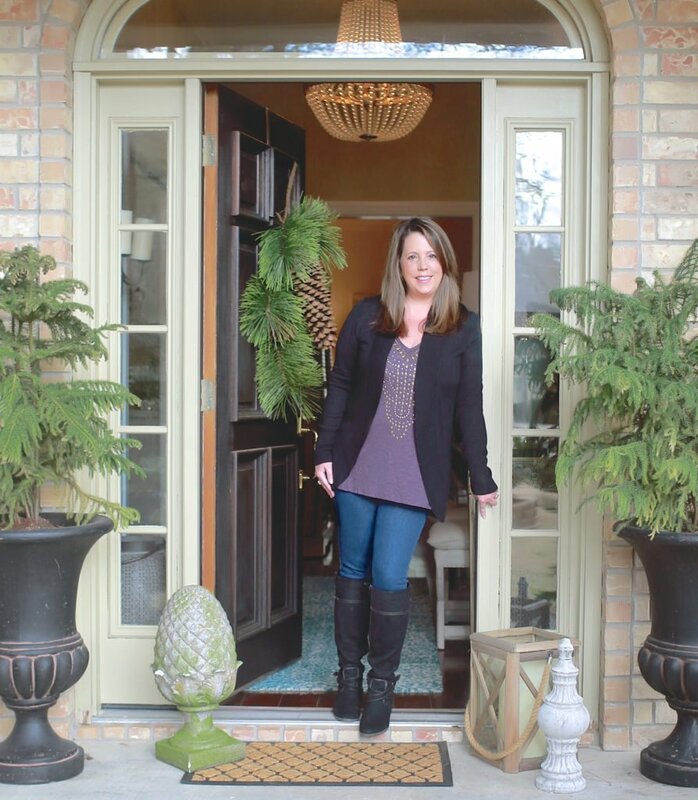 Hi Cyndy, I’m a paint color consultant and was checking out your blog – I’m always curious. I couldn’t have said it better myself – just how I work as well! One other thing I often tell people is to reduce the intensity of the yellows they pick out. I say, “go less yellow than you think you want and you’ll be surprised how yellow it will end up looking!” It’s probably the number one problem I find people have. I am looking for a neutral that will go with blue and green as well as yellow. Pure white is too “severe” for my tastes. Any suggestions? Thank you, thank you for this formula. I have a completely grey house (new construction)and want to start putting color in rooms but not totally eliminating what I have. This was so helpful. Thank you for the great advice! 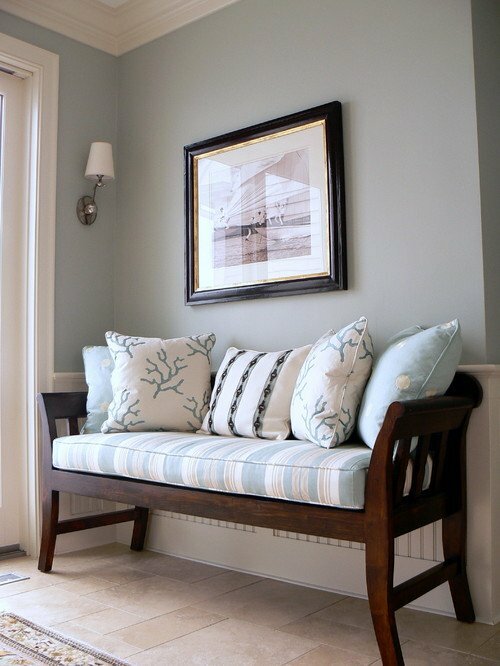 I am disappointed that not one photo shows wood trim left unpainted….the wall colors that I think I love- may not be loved with stained trim… Could you do some sample photos like that???? I totally agree. The post was wonderful, but not everyone has painted trim. I would love to see a similar post with wood trim pictures included. I just painted my great room with very high ceilings with SW Mindful Gray. I love it on the stairway and on the south wall. However, the east wall (24′ in height) looks blue as blue can be. I am not sure I can live with a blue family room. I love gray and thought Mindful Gray would go more green if anything. Any thoughts on why this looks so blue? I have a wall of windows on the north wall. The night time is the worst. If anyone can help me by giving me some ideas, please do. what paint company are these colors from? i came up w a way to eliminate certain color undertones after having a hard time with BM whites. Every time I came home w a BM beige or white it went up looking peachy. Ask store to look up the formula on their computer. If it has red or orange in it I stay away. I like colors that have black in them. I wish companies would add the formula on their swatches. I have been buying paint samples like a lunatic. I paint a little part of my wall & a papercard for reference. The paint looks beautiful in the jar & sometimes on the card but on the wall, the color never matches. I don’t mean the shade is off but the color simply changes. For example: bm revere pewter looks purple on my wall, SW assessable beige looks blue purple, SW escape gray looks blue & for goodness sake the beautiful SW Sea Salt by day I feel like I’m trapped in a robins egg & by night a baby boy’s room. I’m devastated. To date I’m happy with only 2 colors I’ve painted repose gray SW (gray/blue )I’m ok with that although my test didn’t look like that. 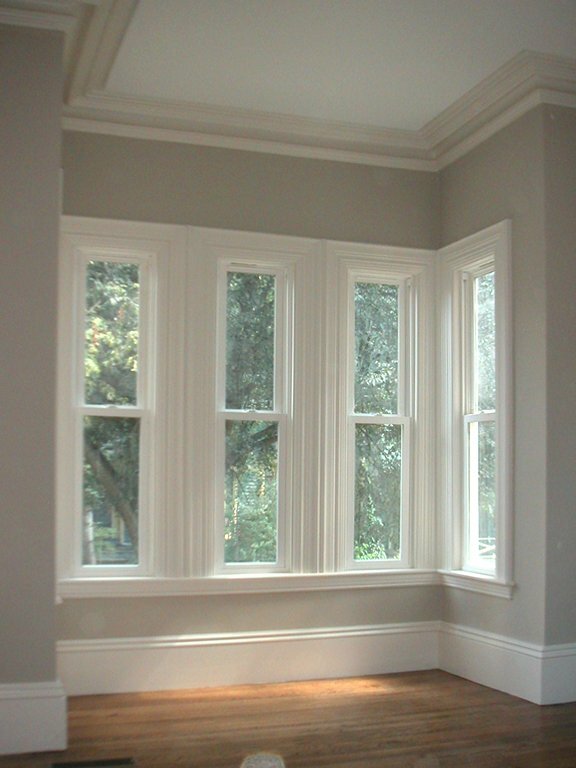 Also lyndhurst gallery beige valspar (Gray/beige). How do I fix these colors so they will be their true colors. I have lots of natural light in the day. Every picture of SW Sea Salt I see draws me in, but the sample I painted on my bathroom wall looks so bright and almost neon… then I see another picture like the one you have of it above I think I must be just seeing things wrong and want to go for it. Diane, Sea Salt is a “chameleon” color. While it’s probably one of the most popular colors out there, it’s also one of the most finicky and can go bright and strange in certain lighting conditions. On a hunch, I’m going to recommend Quiet Moments from Benjamin Moore for you to sample. If Sea Salt is going “neon” in your space, I think Quiet Moments will work beautifully and give you the Sea Salt color that you love in all of the images. I would love it if you came back and let me know how the sample worked. Don’t be fooled by the gray look that Quiet Moments has on the card, I think the green in the undertone will come out in your space just like you see in Sea Salt. Hope that helps. I need help with picking true grays! I am painting our study a darker gray and two boys bedrooms, one light and one medium. I thought I had them picked: SW Dorian Gray (or mindful gray) and Dovetail for bedrooms and gauntlet gray for the study. All from the same color strip. But after going and looking at bedding today I realize the grays seem on the brown side. Any suggestions? Although I don’t mind this, it seemed like it will be hard to match bedding. Also, is the gauntlet gray too dark? It will be against white bookcases so thought the color would standout. Thank you so much for sharing all your paint choosing wisdom with us! I’m moving into my very first own appartment and there’s so much to do I wouldn’t be able to get it right without the help you and other bloggers put out there through your articles, so THANK YOU! So much! Gabi. I had a really hard time picking my Sherwin Williams color for my Living/Dining and stairwell area.. I wanted a gray that had a balance of blue and green undertones.. I painted areas on my walls in different areas of lighting ..I was trying to get a shade that went with the green shade we have in the family and kitchen area.also a deep red on on a couple of accent walls.. I was online looking at Home and Garden and a designer had said perfect grays together were Sensible Hue and Aloof gray. So after I thought I had my color picked out I went with Sensible Hue. It is really pretty however I think it has too much of a blue undertone in some lighting..It bothers me and Don’t know if I should tweak it a little by painting another coat on top of it with Anew Gray and kick out some of the blue? do I just leave it and live with it…or make some changes with pillow colors or something…? Do you have any advice on this..
What is the blue color in Contemporary Bedroom by Minneapolis Interior Designers & Decorators Martha O’Hara? I just painted my 500 sq. Ft. Bedroom ceiling with Glidden universal grey.I would like to use different shades of grey on walls any suggestions. 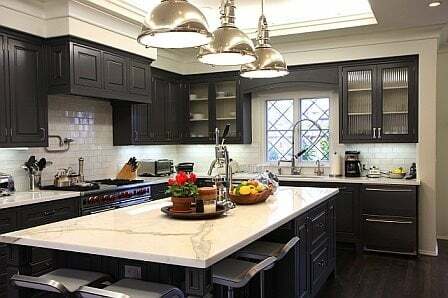 We painted out kitchen w Cathedral Stone from Valspar. Would like to know your opinion on lighter colors for an adjoining entry/hallway. 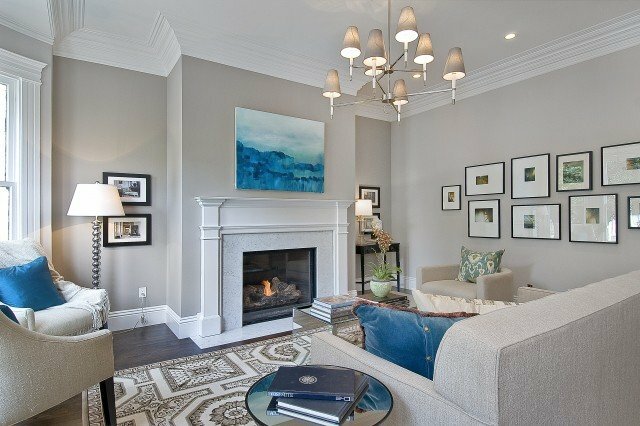 I noticed that all of the pictures reflect the current decorating trend of painted trim and the paint choices, to me seem mostly grey undertones. I love my oak trim even if it’s not “current”. I’m having a really difficult time finding inspirational photos that will help me with my colour selections. Any advice? How I wish I contacted you before we had our kitchen, living space, and entryway professionally painted. Because I am now experiencing what you might consider as having paint color choice remorse! I am literally having sleepless nights because I’m so disappointed in my color picks–I know silly right? The problem is I think it’s too monochromatic with my furnishings and lacks that WOW factor! But I do like how the color gray horse BM looks in our kitchen. I think that maybe it’s because the cherry wood cabinets contrast well and compliment the wall color. 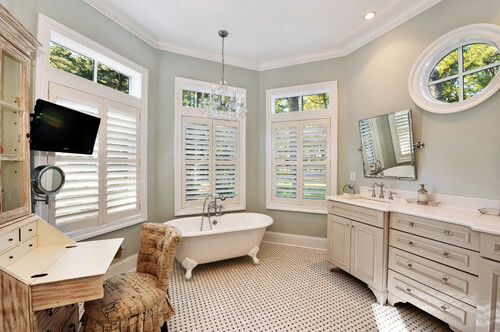 Also our white plantation shutters and white backsplash stand out nicely. What I can’t live with is the color I had the entryway painted, vapor trails BM–it’s too baby bluish and too blah. What I didn’t realize is how the yellow staircase wall and large south facing window above the front door would affect the color in the entryway so much to look light blue. I really could use some help! I plan on having the entryway repainted after the holidays and as soon as my boyfriend recovers from all the disruption with our recent remodel…… Eventually I’d like to paint the staircase and loft too. So I need two paint color suggestions. Wait a minute, haven’t I gone through this before. Not suggestions, but specific color names because apparently I am color challenged. WOW! Cyndy, I have been searching for you! haha This advice comes at a wonderful time. Your time generosity is so amazing (reading in your posts)! Thank you so much! I just put a new counter top in the kitchen and it is time to paint and pick out a back splash (then on the the LR an DR)! My patient husband is on-board with what ever I want , but I can’t decide. We have incomplete projects (removed counter with back splash and now have none and it is currently 2 toned, HA!) due to this. He would like it to look better and I am afraid to do WRONG. I have very difficult to match pickled oak cabinets with a pink undertone (yeah, thank you, I picked up on that!). And I love the grays and blacks (counter top now). I assume I need to have a gray kitchen paint with the same undertones (reds)?? Or an adjacent undertone(blues)? If anyone knows?? I would love to here from you… ***I loved the BM Revere Pewter! If this has the same undertone…that is IT! I painted Revere Pewter in my living room and dining room and highly recommend, especially if you want a warm gray and you have a fairly well lit room. In the darker corners it can go muddy gray-green, and I don’t mind that so much, but in lighter areas it is just a perfect greige/warm gray. Getting ready to use Collingwood by BM in my bedroom after trying no less than 9 colors on my walls (lol). People probably think a crazy lady lives there! (To contrast, when my daughter wanted Sofia the First purple, I looked at 2 or 3 cards, bought one sample, and painted the room that color a day later! Great post, I need help with tremendous and finish. 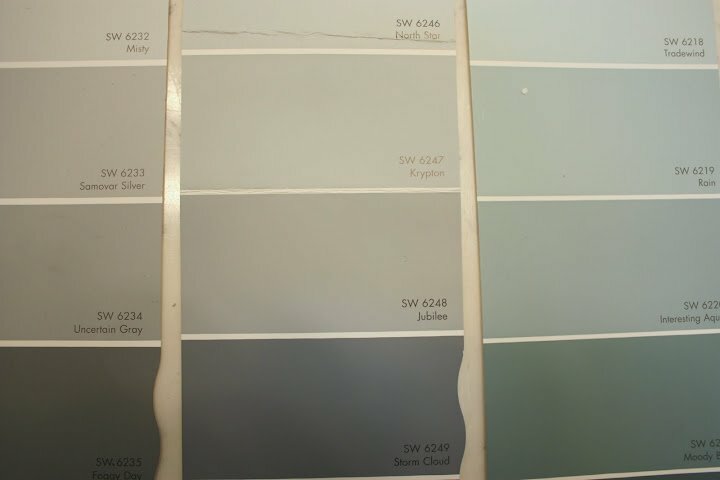 I’m leaning with Sherwin Williams repost grey but don’t know which white to use for the ceiling nor which white to use for the trims, doors crown and baseboards. Also which finish to use. Most pictures (even on your posts) look matte. But I was told matte doesn’t hold up well. Also was told all trims should be high gloss but it seems it’ll be tacky. Any recommendations? Thanks so much, you’ve helped me immensely! Getting ready to do some painting now?? I pretty much do all of this already except for the idea of picking color palettes around the ones you like. If I think I want to do gray, then I usually just pick all the grays I can find unless the undertone is obvious and not what I want. So I feel good about my process but like that part of your suggestions. Also, I absolutely second your recommendation to put the sample on your wall (or a poster board) and live with it for a few days. It is really amazing how much a color can change in various lights – bright mid-day, early morning, evening, dusk, cloudy, etc. In my previous home I was picking out a dark tan and when I put the sample up, I realized that it became a weird pinkish tone in the early evening light – not at all what was going to look good in that space. 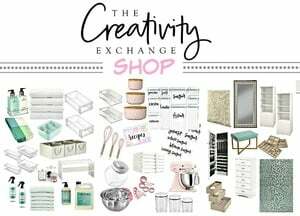 I usually narrow it down to a few color options and then buy samples and I paint 2″ x 2″ or 3″ x 3″ patches on multiple walls in the room to be painted then look at the light effects throughout the day (so do this on the weekend if you work all day). I have always ended up with what I wanted by doing this. I painted Benjamin Moore Smoky Green cc-700 in my kitchen/dining/front entry areas, and am totally stuck with finding something that looks good with it in the back entry and hallways. I’ve been wanting some kind of grey but don’t want the colour to fade into the Smoky Green. The back halls do not have natural light on them so didn’t want to go too dark. With winter coming I don’t want to feel cold and dark in here. Suggestions for greys to look for? Benjamin Moore. Oh, was also going to mention, the picture with the palladian blue colour mentions it is a Sherwin Williams colours, when I do believe it is Benjamin Moore. 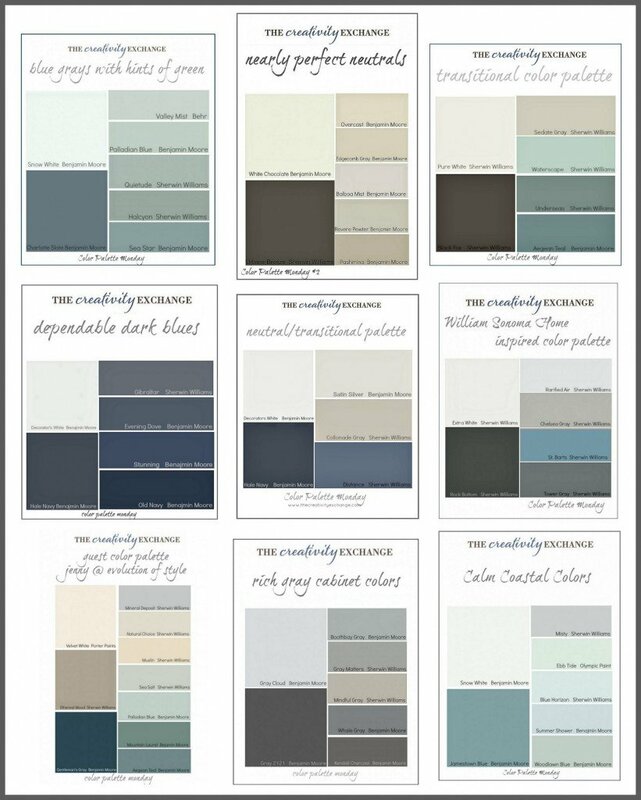 Please help … I have been searching for a color to start my redecorating efforts and you have been very helpful in supplying the information on every paint color but the one I really liked. 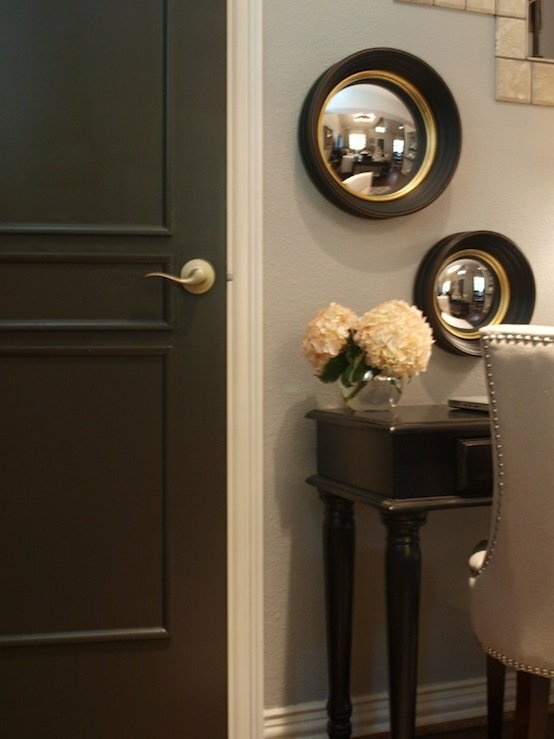 Can you please tell me what color is used in the picture entitled Traditional entry by Greenville Decorators. My favorite was also the Traditional entry! After quite a bit of searching on the internet I found the picture above credited to ‘Traditional Entry by Greenville Interior Designers & Decorators Linda McDougald Design | Postcard from Paris Home’. 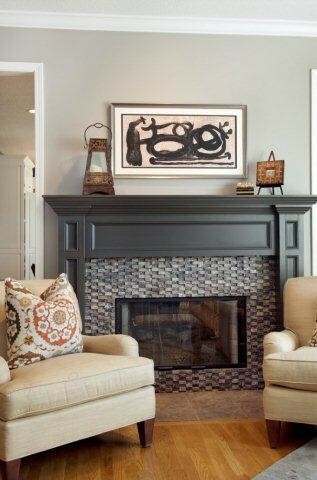 The color listed on the picture I found from Linda McDougald is Benjamin Moore Berkshire Beige. Hope this helps. Hi! Just wondering what recommendations you have when choosing paint to cover walls that already have a strong color on them? I am re-doing a bedroom that has both purple and blue walls in bright/medium shaded (was a kid’s room). I’ve put samples on the wall but the color looks different from the blue wall to the purple. I’m a male with no talent in color selection. Please a little help here. I’m redoing my kitchen. 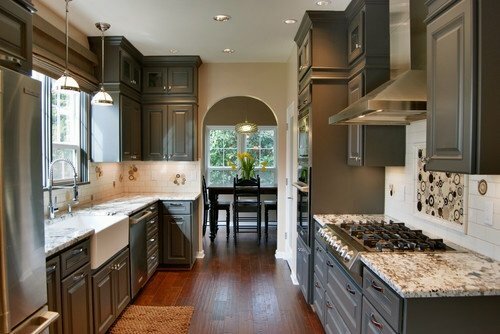 i,ve got absolute black granite counter tops, stainless/black appliances with med oak cabinets. I see all sorts of color schemes with white cabinets but i’m in love with oak woodwork throughout the house. flooring is to be determined after color is selected. so what would be a good color choice. i’m lost! Wonderful post! Thank you. Can you help me understand how to pick out undertones? I have no idea how to determine what an undertone is or how to describe it! I have a question and need a little help. We recently purchased a townhome at the beach. All the walls and trim are painted the same color, off/antique white. We would like to paint the walls without paining the trim,leaving them the off white. What colors would you suggest to paint the walls, for a neutral look? Thank you so much for posting this useful tool to take the stress out of which color to choose! I can’t wait to begin to pick new colors for our beach home later this year! I know the color flow from room to room will look amazing.